Former S1 class series champion Daniel Bray is back in the United States this week preparing to contest the double-header first and second rounds of this year’s Superkarts USA (SKUSA) Pro Tour. Aucklander Bray, 25, won the premier S1 class title in 2011 but slipped back in the standings last year after failing to finish the final race at the final round in Las Vegas in November. He’s back for another crack this year though and reckons he has track advantage this weekend. One thing Bray will not be short of this weekend is race fitness, having just come off successive rounds of New Zealand’s own Pro Kart series as well as the annual GoPro-sponsored National Sprint Championship meeting at Easter. At that meeting Bray successfully defended his New Zealand Open class title and finished a close second to GP Karts teammate Mathew Hamilton in the KZ2 title fight. The SuperKarts USA organisation’s annual ProTour has been going for four years now and gets bigger every year. This year a record number of drivers – 220 across eight categories – have entered the SpringNationals meeting and the total prize money pool for the series as a whole has risen to just under $US100,000, with just under $US10,000 up for grabs this weekend. An interesting feature of this weekend’s meeting in Tucson is the shape of the track. Built in 2005 it is an exact 8/10th scale replica of the famous Suzuka motor racing circuit in Japan! 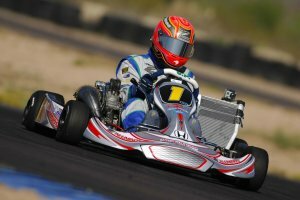 As he has done for the past two years Bray will commute back and forth from his Auckland base to rounds of the Pro Tour, the third and fourth being held at the big SummerNationals meeting in Colorado in July, the fifth and sixth at the 17th annual SKUSA SuperNationals in Las Vegas in November.